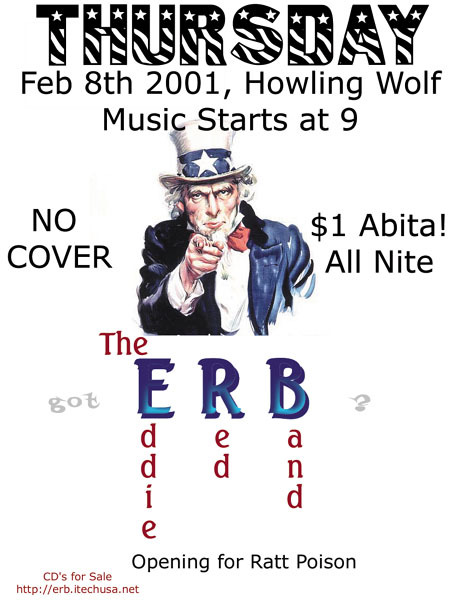 the Eddy Redd Band ~ New Orleans' newest funkadelic rock explosion! Supabad Productions is proud to serve up the Eddy Redd Band - a union of friends with diverse musical tastes - to music enthusiasts with a sweet tooth for funky rock and blues. "Oh my God, simply the best live band in New Orleans!" quotes someone who's name I can't remember . . .but this group is making a ripple on the local live scene with recent appearances at Howlin' Wolf and other area venues. So far the Eddy Redd Band has already amassed a healthy collection of original tunes and recorded a 5-song sampler CD in anticipation of a full album. When asked for inspiration and influences many well known names such as the Meters, James Brown, Black Crowes, Aretha Franklin, Red Hot Chili Peppers, Stevie Wonder and the like come up. Of course the sound of New Orleans is inherent and inescapable with frontman Craig Caliva splitting duties between trumpet flairs, guitar licks, and lead vocals. Fraternal twins bassist Kyle Sclafani and drummer Nick Hingel comprise one of the best combinations since PB&J. Guitarist Travis Morgan is only too happy to mix in his sonic stew over the good vibes this quartet produces. In a world of boy-bands, teen-queens, shock rock, and rap wannabes it's refreshing to listen to a group of real musicians that work hard at having fun and want to share the music with fun loving people. Spontaneous jamming is a strong point for the band but well crafted songs serve as vehicles for the free thinking expressions of these unique and individual musicians. Spend a moment to experience the Eddy Redd Band!